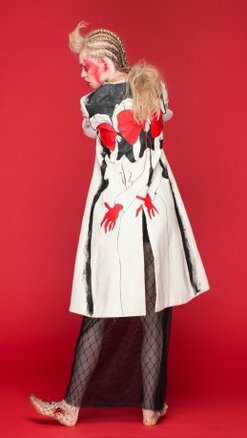 Like many young fashion designers, Ukraine’s emerging talent have prospered from the global nature of contemporary fashion, where travel and international opportunities open the door to transformative knowledge. In ‘Wish You Were Here’ they find a place to pause, reflect and prepare for the new journeys that emerge from their experiences. A collective image of the fantastical bus stops found across rural Ukraine, which serve as both ad-hoc meeting places and liminal sanctums, ‘Wish You Were Here ’ reminds us that even the most familiar, everyday symbols can be sculpted and graffitied into something distinctly local.